Groom Creek Equestrian Campground was designed for the camper who has horses in mind. 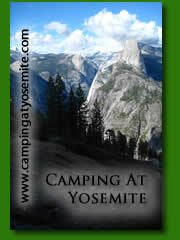 All of the campsites are well spaced and offer plenty of room for large trailers. 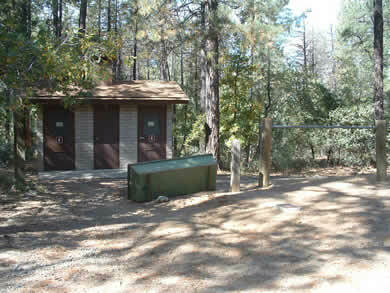 The campground is at a nice elevation of approx 6000' and is surrounded by pine trees which makes a nice summertime camp. 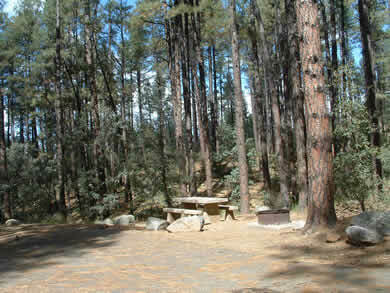 According to the U.S. Forest Service, "The campground has been completely redeveloped as a cooperative venture of the Prescott National Forest and the Desert Saddlebag Club of Phoenix, Arizona. Both groups contributed time, materials, and money towards the camp's construction. Both a volunteer host and a volunteer custodian are on duty to assist visitors to the site." There are several nice trails in the area to exercise your horses including the Groom Creek Loop Trail. Seven of the campsites are on a first come first served basis. The rest of the campsites are by reservation only, and you must make reservations at least five days in advance by calling the Bradshaw District Office at 928-443-8000. From Prescott take Gurley St. East to Mt. Vernon Ave. Then Take Mt. Vernon Ave. otherwise known as Senator Highway South 6.5 miles to Groom Creek. The campground is just 0.7 miles south of the center of the city. Above: Although this water trough was overturned, there were a few more in great shape.